Shearwater was purposefully designed to promote an active lifestyle and sense of community. With amenities like the state-of-the-art Fitness Lodge, 15 miles of trails, multiple pocket parks and a year-round calendar of community events and activities, healthy living has never been easier. Many families have made Shearwater their home because of this lifestyle, including Hannah and Nathan Theus. This recently married couple moved to Shearwater from Georgia, where they met at the University of Georgia as student athletes. Nathan was a long snapper for the Bulldogs, and later when on to be part of the Denver Broncos NFL team until 2016. Hannah played soccer for the university and now teaches kindergarten in the Clay County School District. Together they have a dog who they love taking on family outings with them. 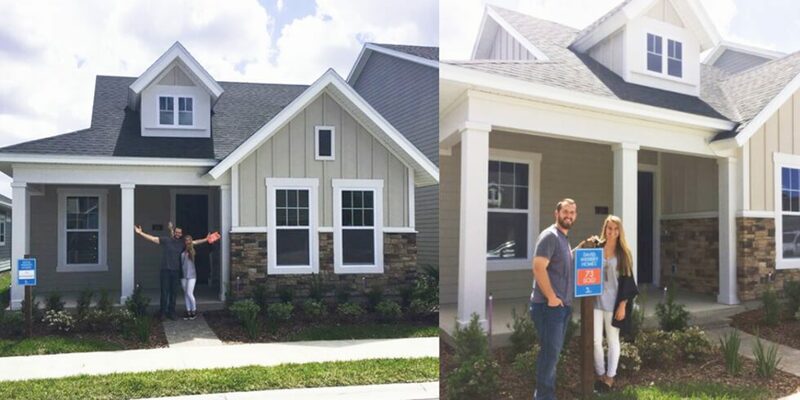 The Theuses say the biggest reason they chose Shearwater as their new home was because of the active lifestyle and front porch living. “The lifestyle played a huge role,” said Nathan. “We love the idea and it’s who we are as a couple,” he continued. Their favorite amenities are the state-of-the-art Fitness Lodge and expansive grassy playfield, where they can get in a good workout and even take their dog to play. They’re both excited to be part of the Shearwater community and are looking forward to the future plans for the neighborhood. Come see the one-of-a-kind lifestyle and beautiful homes that made the Theuses choose Shearwater as their new home. To learn more about Shearwater and everything it has to offer, join our Interest List to receive news and updates.